Most people suffering from a recent stroke decide to take it easy for a while. Not so, David Bryce. 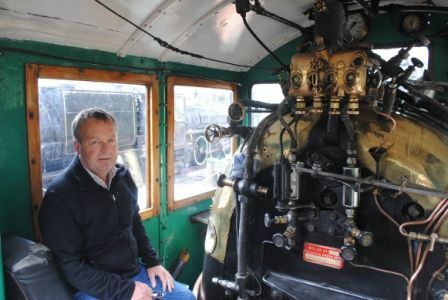 Within a month of suffering from a stroke in March 2011 he had contacted his lawyers and put an offer on The Kingston Flyer, the historic steam train on the southern shore of Lake Wakatipu near Queenstown. “It offered me a great project to get me up and running in terms of rehab”, he insisted. No stranger to adversity, David Bryce, owner of a Marlborough Vineyard, had suffered diabetes for 25 years. Then in 1990 he was involved in a farm vehicle accident. Although he was resuscitated back to life he lost the use of his left arm. This was David’s first experience of rehabilitation involving a daily training regime to regain the use of his arm. It prepared him for what was required in order to come back into the world following his stroke. The stroke was a result of a blood clot in the brain, so debilitating that David couldn’t swallow, eat, talk or walk. But within a week David was home, and with the crucial support of the Stroke Foundation and his family, was back into training, refusing to allow the stroke to get the better of him. “It was a case of mind over matter, that’s what I kept telling myself,” he said. Learning from his first rehab experience he gathered all the equipment he needed to get himself back into shape. David continued to set goals. His first was to walk from his home to his farm in Renwick, about 8kms away. The first time he tried he had to be taken to hospital after a fall. He tried again about three weeks later and made it. David recalls he started shaking, wondering what on earth he’d done. But he also realised that perhaps this was just the kind of challenge he needed to get himself up and running again. And they did. After two years languishing in the railway shed in Kingston, The Kingston Flyer – dating back to the 1890s – was brought back into service with bells shiny and whistles blowing. 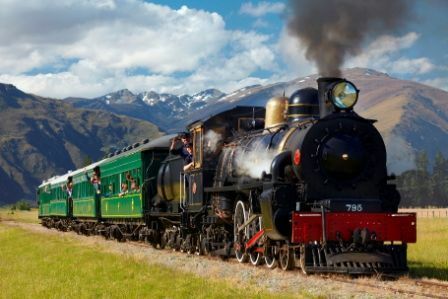 The first 2011/12 season was hugely successful, the locals from Southland and Otago getting in behind their beloved train. David Bryce’s dream had come true. Within the first season David had occasion to thank the Stroke Foundation with an entire celebratory weekend, raising $5500 from a percentage of ticket sales as a donation. It was David Bryce’s way of saying thank you. The public can in turn help The Flyer. David Bryce acknowledges that this is a project “very much from the heart,” such are the ongoing restoration and running costs. Hence in August of 2012 David introduced ‘The Friends of the Flyer’ card. The $65 card entitles holders to a 50% discount on up to 10 regular fares, is fully transferrable to friends and families, has no expiry date and all proceeds will support the Flyer’s on-going restoration. And, David adds, a Friends of the Flyer card would make a great Christmas present. One can’t help but draw an interesting parallel between the life of The Kingston Flyer, and that of stroke survivor David Bryce. Perhaps David’s compassion for the ‘Old Girl’ came from his personal situation. Not one to sit back and accept a diminished way of life, David Bryce not only took responsibility for his own rehabilitation, but that of one of our most cherished historic icons, too.